Converter brackets sold individually. One bracket holds one drive. 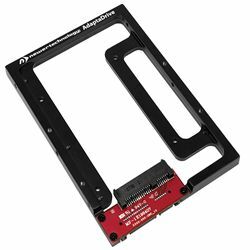 With industry standard 3.5-inch drive screw mounting locations, the AdaptaDrive enables you to install any 2.5in laptop SATA hard drive or solid state drive into a 3.5-inch SATA drive bay. It supports SATA 6.0Gbps, so existing notebook hard drives can be utilized for extra storage, or a high-performance 2.5in SSD can be added for an incredible system speed boost. Includes 8 mounting screws. Drive not included. Pros: My case, a Lian Li PC-9, has a passive sata backplane 4 drive cage. I had been delaying moving to an SSD for my os as I wanted to keep using the swap feature provided by the drive cage. The AdaptaDrive perfectly fit the bill. Feels smooth and solidly built. Converted my new SSD to a 3.5 inch drive. The adaptaDrive mimics the bottom third (or so) of a standard height 3.5 inch drive. So the Lian Li "handle" and rail guide attached to the adaptaDrive and into the the drive cage it slid. Just perfect. Other Thoughts: The SATA connector is a simple pass-through. It just repositions the sata data and power of the 2.5 drive to where they should be on a 3.5 drive. The newertech web page for the adaptaDrive has a nice gallery. Shows the four bottom and six side (three per side) mounting screw holes that should work with most drive rail systems. If your drive/rail system needs to latch near the 'top' of the drive, or the 3.5 inch label side of the drive, you may have an issue. But I have not seen systems like that in years. 463 out of 907 find this review helpful.